After about 4 years in Chiang Mai, I finally made the move. And what a move! I was so stressed out over our things making it in Kuhn Jan’s truck. I was fretting over the motorbike falling out of the truck as it seemed precariously perched on the tailgate. And I wondered how the office chair and desk were doing on the top of the truck cover. But we did it. Kuhn Jan did it. Somehow we survived the mountains without a slip or a hitch. Oh, but how we sweated, I must have lost half my body weight in water that day. No, we didn’t Evil Knievel the bike into the pickup. As I’ve previously posted, I lived in 5 different neighborhoods in CM. One of them was 14km from work in the bamboo woods. Affectionately dubbed by friends as the “cat cave” and not so affectionately dubbed as “a shithole” by another. It was a rustic cabin, to say the least. I battled Mother Nature and her elementals, and sometimes lived with power outages and other minor inconveniences that strengthened me in ways that I felt would surely come in use one day. That day, I believe, has come. My last place in CM was in the city center, conveniently close to everything, so I started walking to the market, work, wherever I needed to go. When I lived in the States, I was conscious of my commute time and enjoyed walking and cycling as much as possible. I didn’t want to use the car unless I had to. I know, how un-American of me. But walking in CM, for those of you who know, is challenging and often unpleasant. At the beginning of 2013 (yes, it’s been that long), the wear and tear of the city was starting to get on my nervous system. The traffic pollution, the noise, the tourists, the lack of clear and clean walkways were hard tradeoffs to having friends and family nearby. Work was overall, pretty good, but I felt the winds of change rustle the old leaves, and help the new ones to shine and wag in the light. It was time for a new challenge, new students, new colleagues and a new city that would foster the growth that I crave and enjoy. I think that is why I like teaching (and writing), you can get into a routine and you can experiment. So it was time to move. When I told my mom I was moving up here, I was pleased to learn that she lived in Chiang Rai for a couple of years when she was a teenager. (I’ll dig up more of that story later.) Although I first visited Chiang Rai in 2009 when I first moved to Thailand. My then boyfriend and I went on personalized tour to Doi Tung and the tea plantation of Mae Salong. We loved it. 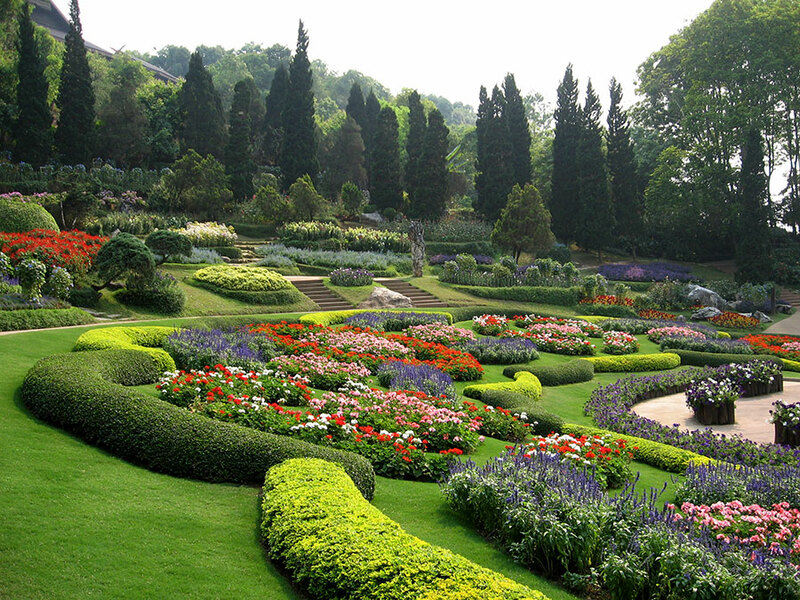 2009 Doi Tung, prettiest gardens I’ve seen here. 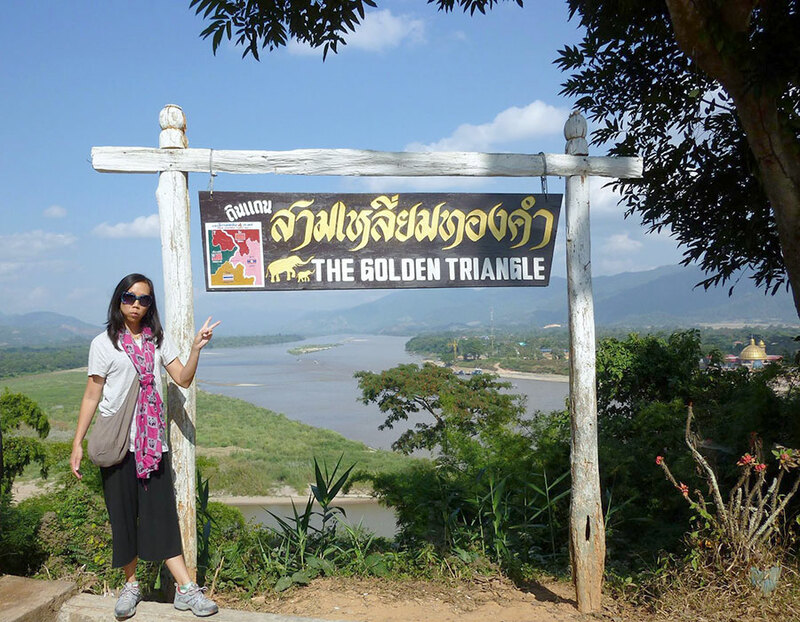 In 2010, my friends and I drove up to the Golden Triangle and Mae Sai. That was another memorable trip because it was a new place for me. I like seeing new places. We stayed in CR, in the same guesthouse as when I was here in 2009 (the Ben Guesthouse). The guest house was bigger and had lost its old charm, but it’s an overall alright place to stay – very Thai. The day after Christmas, Golden Triangle, of course. Last year when I was thinking about moving up here, I took a better look at the city. It is unremarkable, as far as Thai cities go, which is saying, it’s rather average, but I was curious to learn about the other side of it, the side that goes unnoticed by passersbys. I tried to envision myself here. I wondered how I would fit in. And a month ago, when I was looking specifically for a home, I indeed uncovered a little more, which seems natural since I received help and because I was making CR my new home. I think CR has more to offer than it first appears, but it’s all about what you want and what you are used to. As I sink my teeth into this town, I’ll be able to better compare CM and CR…stay tuned. I didn’t know tokay lizards eat bats!!! But unlike my last house, and despite this place being so much more open, we are not getting inundated by mosquitoes (famous last words). It’s incredibly green. It’s quiet and feels safe. There are little stores and restaurants easily within walking distance, and folks are friendly in a small town way. Folks are friendly in CM too. But when you live in a tourist town, with international backpacker scene, it has a different feel or vibe. Living in a local town such as CR will be the tradeoff to not having “Western conveniences” and will most likely spare my pocketbook and revive my Thai language skills. But who knows? I’m cautiously optimistic. 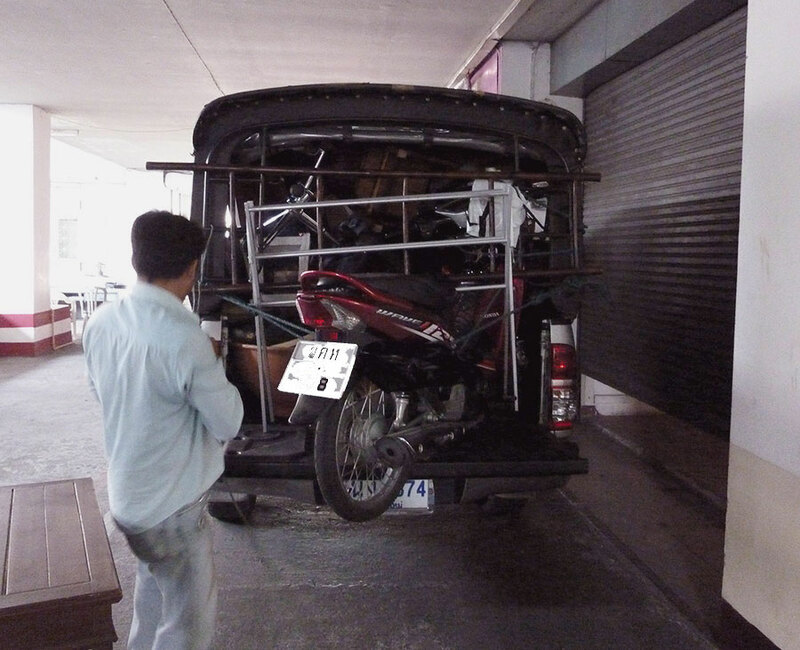 Seeing the photo of your moving transportation reminded me of our first day in Thailand. We went from Bangkok to Hua Hin and after about an hour on the road I mentioned to Lin, “It must be a Thai thing. It will fit. If it doesn’t fit …. go higher!” Congratulations on your move and I look forward to your experiences, as always. Thanks Vince. It was crazy because my partner and I were like, “I don’t know…” and my friends were like, “You’d be surprised what Thais can do.” and they, thankfully, were right! Amazing! A lizard that is large enough to eat a bat might be a lizard that is too large for me to feel comfortable around! Haha. Glad to hear you’re settling in. Sounds like a nice mix of out of the way, yet close by to things. Yeah, I’m hoping so! We actually have a group (or family) of large and small geckos/lizards that I’m happy to have around because they eat all the bugs!!! Glad the move went without a hitch. It’s always interesting to see one’s life arranged in the back of a truck (helluva pack job, by the way). Best of luck settling in and I hope it feels like home to you soon. Thanks Rhyan! I appreciate it! Wow, awesome. Looking forward to hearing about adventures from your new city! Lani, Enjoyed reading this. We (the writer’s) and I will miss you. But now I can visit you in Chiang Rai. Wishing you happiness in your new life, but sounds like you’ve already go it. Miss you writers too! Don’t be shy in sharing stuff virtually, I’m happy to look over some of your work Sandra! Now I need to get writing! We’re moving towns this summer, too, Lani. I love the way you bring closure and a sense of adventure to your move! What a wonderful new adventure, Lani. Chiang Rai sounds like a wonderful reprieve from touristy Chiang Mai. It sounds like you will be happy there. I am looking forward to reading about your adventures and impressions of your new home. May you be blessed in this new phase of your life. Gosh you had those lizards crawling around the house? 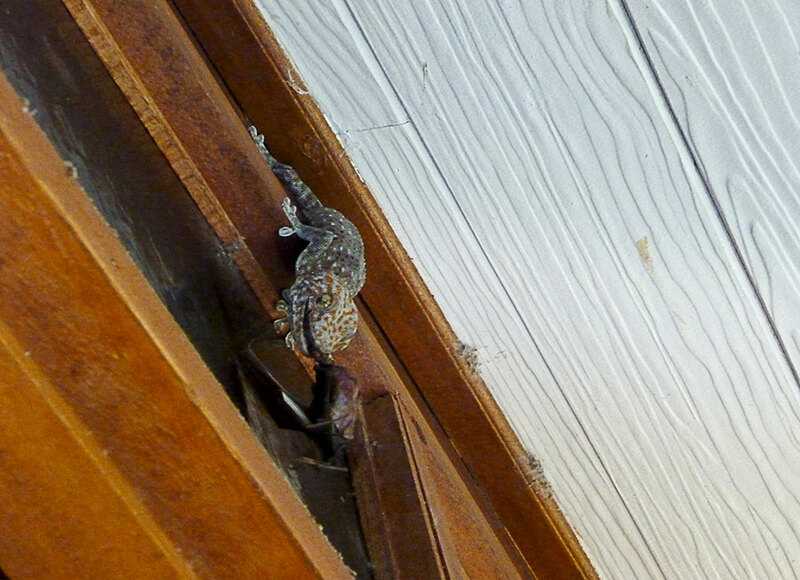 Eek..
Everyone has been commenting, they like our place, but not the lizards and geckos! 😀 But this Hawaii girl is used to them, and so they don’t bother me at all! How is the weather there so far? I’m hoping to take a trip to CR with my wife and kids this summer. We have a house south of town (near the white temple) that we can rent. It comes with a car and scooter. Is the traffic OK or suicidal? We won’t be within walking or biking distance of the city. Hi Stu, so far the weather has been HOT and HOT. But CR gets a lot of rain and storms too, so you will have to do a weather search when the time gets closer to your arrival. Traffic is fine. It’s MUCH tamer than CM or BKK. Take it easy like everyone else (except a few teenage boys), and you will blend in 🙂 Have fun! Lani, I like your blog — lot’s of cultural stuff about meuang-Thai, and very pleasant humor. My Dad was a teacher in SE Asia when I was a kid and we lived for a short time in Thailand. Gonna go back! I’m taking Skype’d Thai lessons (iwanttolearnthai.com) and that led me to other Thai language sites and the fun youtubes you did with Mia. I have some great photos from 1969/1970 Bangkok (i’m dating myself here) I could email, if you are interested. Also, I attended Washington Middle School in Honolulu, the “toughest school in the Islands” in 8th grade! Thanks Stu. Learning Thai is certainly useful and a lifelong chore! Glad you found me, and yes, I’d love to see those pics if you want to share …Was Washington the toughest middle school? I think there are other contenders! I was actually on the Mainland for middle school years, but when I returned I went to Leilehua High School in Waihawa – and let me tell you that wasn’t exactly a place of learning 😛 Nice to meet you! Oahu schools could be rough. Heh, you like one beef?! Actually, this blonde, blue-eyed guy had more trouble with the other haoles though! My wife’s mom is from Japan and we very often go back to the Islands. In the proper Hawaii pidgin, my wife is a “hapa-haole Buddha-head kine sistah”. I don’t know of a proper pidgin phrase for a Thai/Chinese woman. You are unique! I’ll email some old Thai photos. 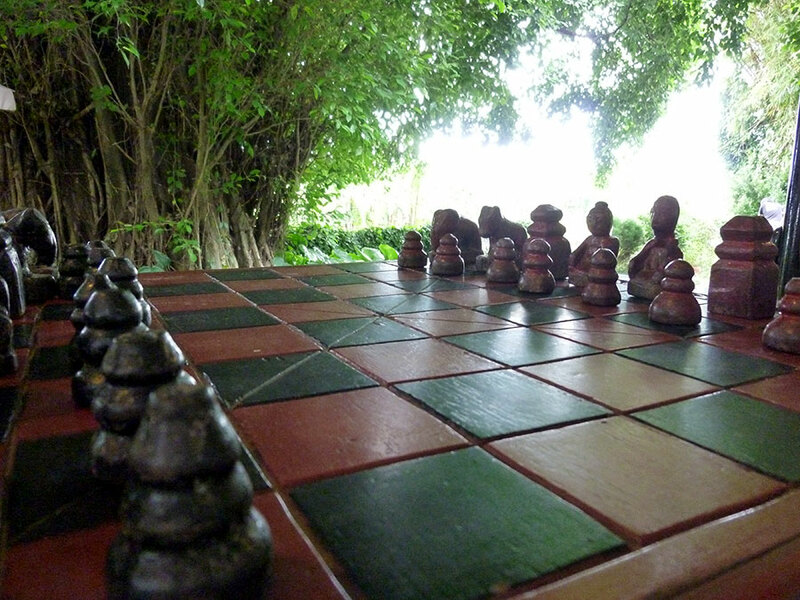 Please keep blogging about your new experiences in Chiang Rai. Thanks. BTW, I like the way your site looks now. Clean design. Congrats on your move and hope you are enjoy being up north. Chiang Rai’s lifestyle is very much like Chiang Mai was when I first came here. Be well and happy. The Golden Triangle! I’ve walked around the poppy fields in Northern Laos which is part of the triangle. Things can be rather basic in that part of the world but people are probably happier than their counterparts in the West. Each have their stresses but its surprising how much of the trappings we have in the West we can do without and not miss. Ian, when were you here last? I’m curious. Thailand has probably changed a lot since you were here, but I’m guessing.